Cleveland Browns: Could Leonard Fournette fall to the Browns? The Cleveland Browns have options with the No. 12 overall pick in the Draft, including LSU running back Leonard Fournette if he falls that far. Three words: Best. Player. Available. Former LSU running back Leonard Fournette was the hot topic of conversation the entire 2015 college football season. Fournette rushed the ball 300 times, averaging 6.5 yards per carry, for a net total of 1,953 yards on the ground and totaled 22 touchdowns. He was already being compared to some of the all-time greats like Bo Jackson, Herschel Walker, Ricky Williams, Adrian Peterson and others. Fournette was the easy choice for the Heisman in 2015 up until some late season struggles and the emergence of Derrick Henry and Christian McCaffery. 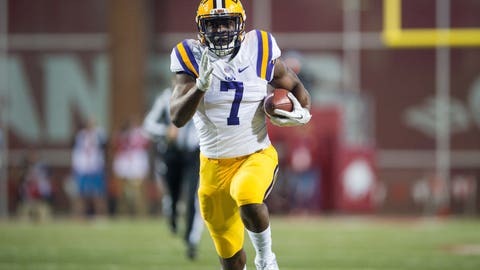 Once the 2015 season was over, most said the Fournette had nothing left to prove on the field and should have just sat out the entire 2016 college football season and prepared for the Draft. The rusher was limited in the 2016 season with an ankle injury that only allowed him to play seven games, yet he still totaled over 1,000 rushing yards and 10 touchdowns. Fournette became a talking point at the towards the end of the season when he decide to sit out LSU’s bowl game against Louisville in order to get healthy before the draft process. Most criticized his decision and said he was a quitter “giving up on his team”, while others supported his decision due to the fact that it is a business decision to prepare for his future. Fournette later attributed the decision not to play to when his coach sat him down and told him that he wasn’t going to play, according to a story on NFL.com. Some scouts have said that Fournette’s decision to sit out his college team’s bowl game could effect where the second overall prospect on most analysts draft boards gets drafted. The real question would be how far could he end up dropping? The Cleveland Browns own the No. 1 and No. 12 pick in the 2017 NFL Draft, with the only team with a need of a playmaker at running back being the Carolina Panthers at No. 7 overall. If Fournette falls as far to the Browns at No. 12, the Browns could be racing up to the podium to pull the trigger on this kid. At 6-foot-1, 235 pounds, with his size, speed and athletic ability, Fournette was built to run in the AFC North. The two things that can take pressure off a quarterback is a great running back and a great defense. If the Browns can get what some call a “once in a generational” type player, how could you be frustrated with that decision?